"On the island of San Cristóbal, a peculiar combination of climate and geology has produced an ideal environment for this coffee. Twice a year, the Humboldt Current passes through, carrying cold winds and rich nutrients that mingle with the island’s fertile volcanic soil and intense equatorial sun for an unexpectedly subtropical climate. The result: 130-year-old Bourbon coffee plants that would normally grow at elevations of 3,000 feet are able to flourish at an altitude one-third of that. It’s from this unique place that we discovered the beans that would become our first ever Starbucks Reserve® coffee in 2010 – an incomparable brew that we’ve longed for ever since. [In 2012] we’re lucky enough to offer an extremely small production of this organic coffee graced with a soft, chocolaty mouthfeel, juicy acidity and herbal and cola notes – flavors that meld into a cup no less extraordinary than the region’s exceptional climate." There’s a fascinating history dating back to 1832 that goes along with this delicious San Cristobal coffee. It was in 1832 that the Ecuadorean Government seized control of the Galapagos Islands, including San Cristobal. As initiatives were undertaken to bring commerce to the Islands, San Cristobal became a likely population center because though surrounded with sea water, it also has an abundance of fresh spring water at El Junco, a volcanic crater lake. This mineral rich spring water keeps the rich volcanic soil moist and fertile, bringing life to the island. Ultimately, land owner don Manuel J. Cobos established the very first coffee plantation in 1975, taking advantage of the altitude, subtropical weather (because of the cold Humboldt Current), fertile soil and fresh water from El Junco. He imported high-quality Arabica Bourbon beans from the French Caribbean Panamá. The original plantation was just 250 acres at an altitude of just 450 -1200 feet above sea level, an elevation in this particular climate that is well-suited to good acidity coffee. Unfortunately, in 1915, this small, quality conscious coffee plantation fell on hard times and was abandoned as unprofitable. It lay fallow for many years. Then, in 1990 the Gonzalez-Duche family purchased Hacienda “El Cafetal” and with renewed vigor and interest started a regrowth of the delicious San Cristobal coffee bean, using the original heirloom plants from 1875. The environmental conditions were so perfect that the plants had grown unattended for decades. Now, the 1000 acre coffee plantation is a stop on San Cristobal for many tourists. The plantation is ecologically sustainable and has been recognized as bird friendly by the Smithsonian Institution. It is certified by UNESCO as a “Patrimony of Humanity” site, meaning it is a sustainable resource for San Cristobal Islanders. 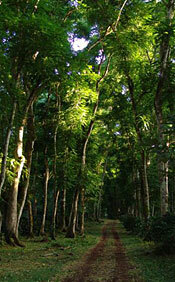 The coffee beans ripen under the shade of other trees, such as avocados, guavas, oranges and towering cedars. Under our strict regulations, there are only 5000 bags allowed for worldwide exportation annually from this plantation. Not only that – and perhaps most important - the shade-grown coffee is totally organic and delicious. The Starbuck's stash is sold out, leaving you with but one alternative – you must come to San Cristobal Island in person and order a cup of coffee for yourself! 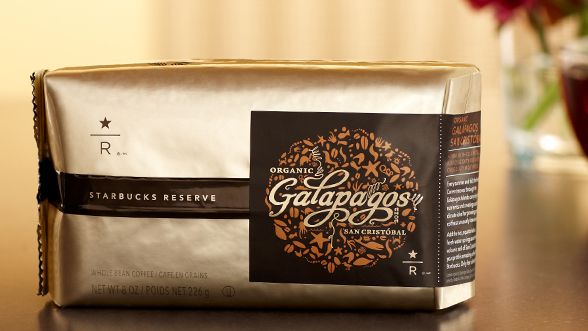 Best of all, come to the Galapagos Eco-Lodge and ask for our special blend. Assuming that Starbucks has left any beans on San Cristobal, we’ll do our best to accommodate you!